When it comes to sales prowess, good ‘ole Tommy Boy is the master of the money-back guarantee, a risk-reversal technique. There’s a little-known, well-hidden closing technique that you’ve likely never heard of called “risk-reversal language”. It’s an exceptionally effective strategy that’s very easy to add to your bag of tricks. There’s a good chance you’ve even used it before without knowing, just not on a consistent basis. The science-backed data provides credibility to the legitimacy of this strategy by showing that win rates skyrocket when salespeople take advantage of it. Sales reps using risk-reversal language experienced an average conversion rate increase of 32% with this one technique. It’s actually so easy to use that I highly doubt you’ll even have to practice it. Have you ever been on the verge of pulling the trigger on a purchase but felt so uneasy about the decision that you were already planning the cancellation or return? Maybe it’s the first big purchase you’ve ever made, or perhaps it initially sounded good before a widespread panics set in that only intensifies with every thought passing through your wandering mind. If you’ve been in this situation like I have, you know there’s nothing you want to do more than run faster than Forrest Gump would if President Kennedy told him where another Dr. Pepper was. The self-talk I experienced as I sat there with a blank stare on my face mulling over whether I really wanted to go through with this or not, created a continuous back and forth in my head. o What if this doesn’t work out like I hope? o What if the salesperson over-promised and under-delivers? o What if the company turns out to be complete idiots and I’m stuck in a long-term contract? o What if I get fired from my job and can’t afford it anymore? As I sat there pondering life’s lovely hypothetical scenarios that will most likely never happen, unsure if I was actually contemplating a decision or just wrapped up in my own curiosity, I suddenly snap out of the alternative universe I was visiting. It’s funny how this always seems to happen at the perfect moment. The anxiety and angst I felt about deciding whether or not I wanted to take the risk of being locked into a lengthy contract for a product I was confident in, but not certain of, was instantly lifted. It felt like a weight had been lifted off my shoulders in a big way. I signed an autograph for him, became a customer and it’s worked out quite well. It wasn’t more than 24 hours after this conversation before those little wheels started turning and that mythical light bulb flipped itself on. What Trey did is what all salespeople need to do: Outline the language in your agreement that you can use to your advantage. Thinking about it deeper, he presented a solution that enabled me to become a customer while drastically reducing the amount of risk I inherently took on. the risk needs to rest solely on your shoulders. It doesn’t matter who the prospect or homeowner is, you can bank on there being some pre-purchase anxiety or doubts. I know you think that overly jacked up prospect claiming that your offer is a “no-brainer” will be a “sure thing,” but it won’t be long before one or more of these has ice running through their veins in a way you didn’t know was possible, if it hasn’t happened already. 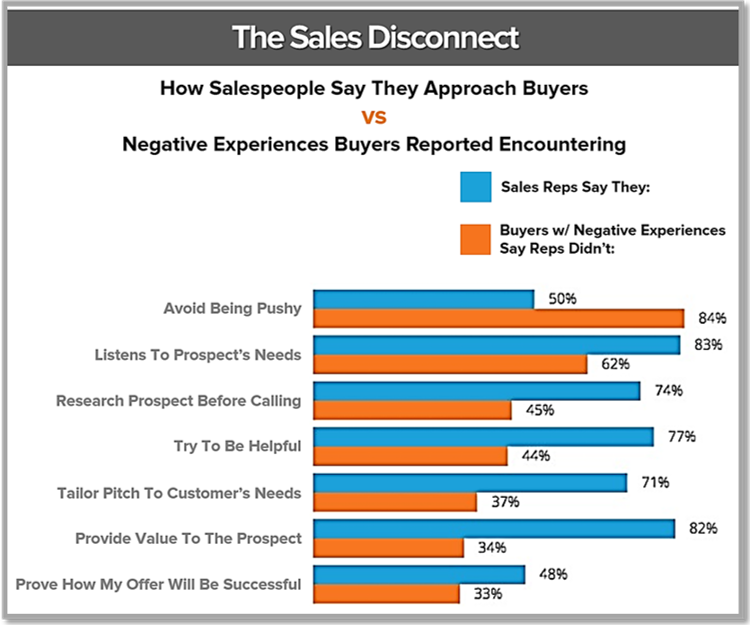 While this won’t tell the whole story, it will tell some of it: A HubSpot survey found that only 3% of people view sales reps as trustworthy. It’s no wonder why they freak out so much when it’s time to fork over some cash. The fact is when it comes time for customers to put their “big-boy pants on,” a variety of emotions take control. Whether it’s fear, anxiety, or something else, it leads prospects to go darker than the night is black when they know you want the digits off of that piece of plastic. In my search to explain this sales tactic, I came across Gong. They identified just how powerful this strategy is, specifically as it pertains to closing. Gong analyzed 25,537 sales conversations with the help of AI. Sales reps utilizing risk-reversal language to eliminate friction see win rate probabilities shoot north by as much as 32%. The reason risk-reversal language is so effective is because it tackles the issue head-on by relinquishing the usual pre-purchase fear and anxiety. By mitigating consumer risk through the use of this type of terminology, you’re empathizing with, and soothing their concerns. There’s a direct correlation among surging win rates and the liberal use of risk-reversal statements. This low-hanging fruit is ripe for the taking. The ease of implementing this technique can’t be stated enough. Frequently discuss deal terms that are designed to protect customers from being exposed to higher levels of risk. This can be as simple as throwing in a sentence like “you can cancel at any time.” The key to using risk-reversal language is to present it everything as a positive, like this was created just for them, and them alone. In the case of a new roof, some people need it immediately but their budget was not ready for such a large expense. $0 down is a great way to bring customers in and build an empathetic relationship. You know their need (a new roof), understand their pain (they can’t afford it right now), and are humanizing the relationship by placing their needs above yours: a new roof now and a payment later. Homeowners have many choices and many service providers offering the same value and service to them. Free installation is a great way to get a leg up on the competition and entice home or business owners to buy from you. Money Back Guarantee. This shows your confidence in your product, which translates to confidence on the side of the buyer. Neil Patel found that by adding a money back guarantee increases sales 21% and overall revenue by 6.4%. Quality Guarantee. It’s not easy to admit, but your product will fail from time to time. Nothing is perfect 100% of the time. Letting customers know that they will not be on the hook for any defects provides great piece of mind. You’re guaranteeing results. Price Match Guarantee. If a competitor is offering the same product for a better price, let your buyer know you will refund the difference. This technique gives sales great leverage in a competitive market place. Even the smallest of protections can tip the scales from a “no” to a “yes.” It may not seem like a lot to you, but could mean the world to the consumer. If you tell the prospect they can cancel at any time, cool – that’s it, that’s all there is to it. 93% of your communication effectiveness is a result of non-verbal inputs, meaning your uninterested, “I don’t give a damn” body language could actually be what’s costing you the sale – not the risk that the customer is telling you instead because they don’t want to work with you. However, if you act like the consumer’s ability to cancel whenever they please is the greatest thing since sliced bread, you’re using the principles of persuasion to influence. While reducing their risk, you’re also adding value. If you’re the only competitor in your market that offers this perk, let the customer know! To be effective using risk-reversal strategies, you have to understand how to incorporate all of your sales skills to make something small appear larger than it is. It’s not always what you say, but how you say it. Tone is 38% of your communicative effectiveness, 31% more than the words you actually say. It’s all of these minor details put together that form a high-powered selling machine. It starts with your communication. Knowing how to close more sales by using the right tone is just another component that makes you one of the people actually achieving that 32% win rate increase compared to just seeing a small bump. Why sales professionals would resist this technique is beyond my comprehension, but it happens. My thought process leads me to believe it’s because they don’t want to deal with the headaches associated with customer cancellations. Our Challenge To D2D Sales Reps: YOU, as the seller, accept and own the risk instead of relying on the company to shoulder the responsibility. Increasing cancellations will be an afterthought compared to your soaring win rate. On average, cancellations only tend to go up by about a point – that’s nothing. When the dust settles, you’ll be sitting pretty in paradise city on a thicker wad of cash than you’ve ever earned.